Hippity, hoppity, the 'bunny' (AKA Mom) is going to love these Chocolate-Dipped Strawberry "Carrots"…and so will all the baby bunnies! Mix chocolate and food colourings in medium bowl until blended. Cover baking sheet with parchment. Dip strawberries, 1 at a time, into chocolate mixture, turning to completely coat strawberry. Gently shake strawberry over bowl to remove excess chocolate; place on prepared baking sheet. Spoon remaining melted chocolate into resealable plastic bag; press excess air from bag, then seal bag. Cut small piece off one bottom corner of bag; use to pipe horizontal lines onto strawberries to resemble carrots as shown in photo. For best results, serve these whimsical treats the same day they are dipped. 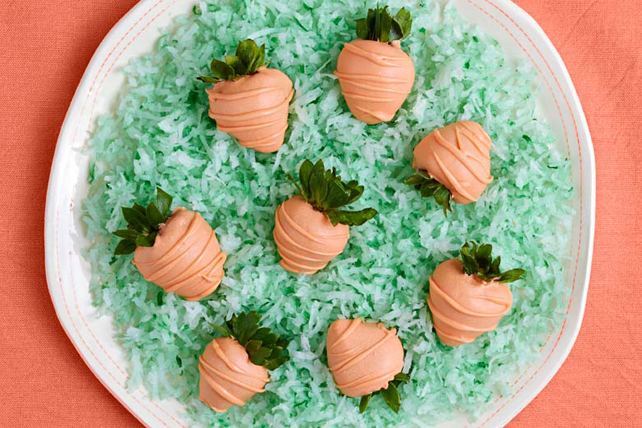 For a fun idea, serve the strawberry "carrots" over a bed of "grass." Tint flaked coconut with green food colouring; spread onto serving plate, then top with carrots. Or to serve carrots over "dirt," substitute crushed chocolate sandwich cookies for the tinted coconut.